Back in March I looked at the effect of wave starts on the course congestion at Ironman Melbourne, speculating that reducing the density of athletes on the course would also reduce some of the drafting. Yesterday Ironman announced a new SwimSmart initiative primarily aimed at safety, but also trialling a number of different swim starts in North America. 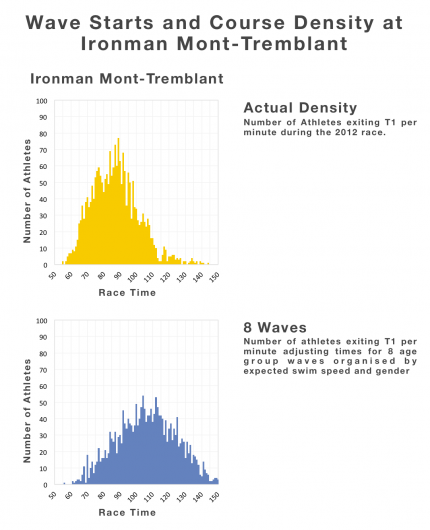 Wave starts are there at Ironman Mont-Tremblant, but also rolling starts akin to road races at Ironman Lake Placid and Ironman Coeur D’Alene. So far the response is mixed, the mass start has a legacy and for some the changes represent a further shift from competitors to participants at Ironman. It’s hard to argue with improved safety measures. Steps to reduce the – already low – fatality rate in triathlon are positive things; increasing and improving training of swim personnel and adding additional safety measures and equipment are sensible steps to take. However I’m not convinced that altering the swim starts will have any real affect on safety. The USAT Fatality Incidents Study found no indication of a relationship between type of swim and fatality rate. It might influence athlete anxiety – although that’s hard to measure – but it does not appear to affect the number of incidents. Of the trials the self-seeded mass starts being tested at Lake Tahoe and Florida appear little different to existing starts; in fact Ironman Western Australia has used swim cap colours to help self-seeding for years. I expect swim start corrals will improve separation of swimmers to a degree, but as I saw running the Bristol 10K last weekend, starting pens do little to stop athletes inappropriately positioning themselves. As it currently stands this approach is low impact barely changing the nature of the race. The rolling start is the more interesting variation. Not as structured as previously used time trial starts – athlete’s times begin when they cross a timing mat before entering the water. The aim seems to be to thin out the crowds and allow athletes to choose when they are comfortable starting their swim. Potentially this will reduce athlete anxiety, but I cannot help thinking of Ironman Lanzarote where a wide queue of triathletes sprint over each other into the sea. It also changes the dynamics of the race – there are tactical decisions to be made about how you start and later how you pace yourself. Unlike a mass start overtaking doesn’t necessarily mean moving ahead; without knowing the start times of neighbouring athletes you cannot know your position in the race. Andrew Messick, CEO of the WTC, argues that as age group markings are routinely covered (by compression gear) we rarely know our placings anyway, but perhaps that is something that should be fixed. Wave starts are successfully used by numerous races including Ironman 70.3 events. They reduce the density of athletes at the swim start and can help reduce overall course congestion. I’ll admit I prefer wave starts. However they also remove the element of head-to-head competition present in the mass start, but with sensible and effective wave organisation and marking I don’t consider this as significant a problem as with rolling starts. By keeping age groups together within a wave there can still be a race for the podium or Kona slots; this is what many are after. Rather than debating the merits of these various starts I was more interested in the overall impact of the changes – would they help clear already over-congested courses? Applying the approach I used with Ironman Melbourne to the 2012 results from Lake Placid, Coeur d’Alene and Mont-Tremblant enabled me to consider how these new starts might affect athlete density. 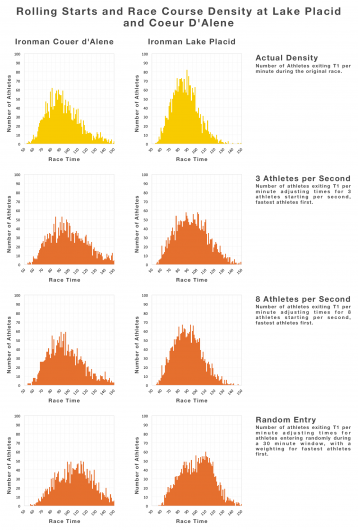 There are inherently many assumptions within these simple models, not least that under a different starting order an athlete’s swim time is unchanged, but they offer some insight into the overall effect. It’s hard to know how rolling starts will work in practice so I tested three different models. The first two assume athletes will start the swim in small groups ordered by swim speed. Using starting rates of 3 or 8 athletes per second successfully eases congestion at the exit of T1; the smaller the trickle of athletes the less congested the course becomes. It’s unlikely athletes will be so well organised so the third test is more complicated spreading them out over 30 minutes based on a set of probabilities. Some fast swimmers will seed themselves further back and some slow swimmers further forward. The model is extreme, but results in the biggest reduction in congestion. If the aim is to reduce congestion, the rolling start may well work. Modelling waves was much easier. There will be 8 waves in Mont-Tremblant allowing a much broader split than I’d previously tested. I kept all age groups intact (the M40-44 wave will be large) to allow good competition for slots and allocated waves such that faster age groups started earlier. Again, the result is a good reduction in congestion at the T1 exit with the potential that other wave arrangements might improve that further. Regardless of their roll in swim safety changing the swim start can have a positive impact on course congestion at a cost to the character of the event. For me the rolling start comes at too high a price, but the wave start enables both an element of competition and much needed reductions in congestion. This of course assumes that waves are well designed and implemented and also that these changes are not used to make room for even more participants. That would be disastrous from both a safety and experience perspective. It will be interesting to see how these trials go, but I suspect the days of the self-seeded mass start may be numbered in all but a few Ironman races.